Great for glitchy granular effects and generating additional harmonic content, though vocals aren't this plug-in's forte. Easy learning curve. Very reasonable price. Great for thickening up synth sounds. Good for glitch-style drum processing. Advanced modulation section. Not that realistic on vocals. Harmonies not triggerable by MIDI. Not enough general purpose presets. No intelligent diatonic harmonisation. MMultiBandHarmonizer is just one of the latest crop of plug-ins from Prague-based MeldaProduction. It's a 120-voice harmony generator that can operate on up to six separate bands of monophonic or polyphonic material. One important point is that the 'harmonies' are in fixed intervals and do not intelligently adapt to the musical key (by switching between major and minor thirds, and so on), making this a pitchshifter rather than a true harmoniser. The plug-in is neatly laid out, with the adjustable band crossover points and levels shown in the top panel, as well as per-band and master level meters. Clicking on a band brings up its available parameters in the Sound Settings and Harmony panels. In Sound Settings, you can pick from Granular, Adaptive Granular and Vocoder modes for each band. The Granular modes are suited to monophonic or rhythmic material where maintaining transient response is a priority - we had great fun processing breakbeats while adjusting the Grain Size in real time. There's a Strumming parameter that staggers the timing of each harmonised part to approximate the effect of a guitarist striking a chord, and this is also good for stutter-style effects (although it can't be synced to your host's tempo, sadly). 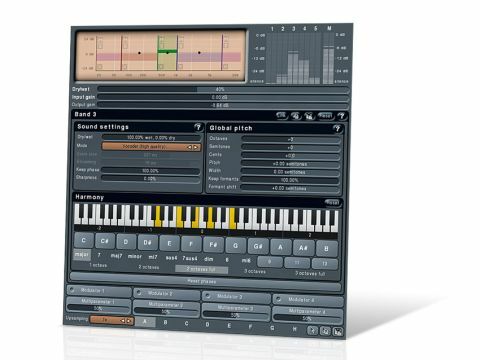 The Vocoder mode comes in low, mid and high-quality flavours for polyphonic and vocal sources. It has sliders for Keep Phase (to prevent unintentional stereo widening) and Sharpness, which can increase or diminish level differences between louder and quieter frequencies - useful for bringing out breathiness, for example. The Harmony panel is where you select harmonies on the five-octave virtual keyboard, and you can have a different one for each band. There are buttons for common chords across up to three octaves, including 9th, 11th and 13th variations. Disappointingly, you can't play harmonies in by MIDI, but MeldaProduction assures us that this will be added in an update. The Global Pitch control panel is where you can set the overall pitch of the effected signal, with two additional parameters for the Vocoder modes: Keep Formants, which we set to 100% for more realistic vocal processing, and Formant Shifting, which is useful for creatively abusing signals. There's up to 4x oversampling too, which makes a surprisingly profound difference. Sound-wise, the results of producing chords from a single sung line weren't comparable to getting a good vocalist to multitrack each layer in turn. However, for adding an octave below or a fifth above, for example, the plug-in performs well enough, especially if the wet signal isn't turned up too much and you wisely set the bands' crossovers - we found the 400Hz-1kHz range the best area to process to avoid Mickey Mouse-esque pitchshifting artifacts. For ardent tweakheads, there are four modulators. Clicking one brings up a separate window, where you can configure an enormous range of LFO shapes - you can even define your own, use a step sequencer and blend waveforms to create new ones. LFO sync and envelope following options are also here. As well as that, the main GUI has four Multiparameter (ie, 'macro') sliders that can be configured to control several parameters at once. You'll also find eight preset slots labelled A-H for fast and easy comparisons, and even the ability to morph between the first four slots. MeldaProduction is currently working on an update that will include 'smart learn' for the Modulators and Multiparameters - in other words, enable it, move parameters and the plug-in will remember each one and by how much you moved them (ie, to set the operating range). Bring it on, we say! For material such as synth lines, pad layers or guitar licks, we found MMH to be a great tool for thickening up sounds, adding harmonic content or giving subtly modulating effects. Overall, it's not an essential buy, and those looking for a natural-sounding vocal harmony tool would be better off investing elsewhere, but MMH is capable of generating some interesting parts and adding depth to your productions.